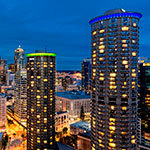 Discounted hotel rooms are available at the Residence Inn and Westin Seattle. To receive the discount rate, you must book your room by October 10, 2018. Need-based grants are available to cover the cost of lodging for Friday night, October 26. Priority will be given to metastatic breast cancer patients living in the Pacific Northwest who require lodging for the conference. Grants will be awarded on a first-come, first-served basis. Please email nwmetsconf@pskomen.org before October 10, 2018 to learn more or to request a lodging grant.